OSWEGO, NY – In keeping with October’s theme of Breast Cancer Awareness, Recognizing Oswego County has selected two Community Champions who are active in the fight against cancer in Oswego County. The Community Champions for October are Carl Emmons and Liz Lucas. 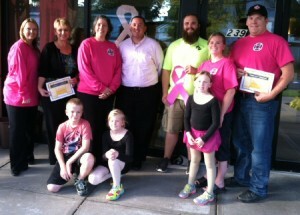 ROC members with October Community Champions Liz Lucas and Carl Emmons. From left, front row: Carl Emmons III, Kiley Emmons, Layla Emmons. Back Row: Carolyn Handville, Liz Lucas, Penny Morley, Brian Coleman, Brandon Morey, Susan Emmons and Carl Emmons. Emmons is a firefighter with the Oswego City Fire Department. Inspired several years ago by his son’s interest in the pink that the NFL players were wearing, Emmons signed the OCFD up as a local participant in the International Association of Fire Fighters’ nationwide breast cancer awareness campaign and has been selling pink T-shirts as a fundraiser. Wanting to keep the funds local, Emmons chose to donate the proceeds of the T-shirt sale to Oswego County Opportunities’ Cancer Services Program, which provides free cancer screenings for the uninsured. Emmons’ efforts are a family affair. His wife, Susan, helps out and his son, Carl III, recently painted his go-cart pink and raced it to raise awareness. T-shirts are available from the OFD until the end of the month, while supplies last. Call the fire station at 343-2161 for more information. Lucas is a cancer survivor and is currently in total remission. Having been through chemotherapy and being a salon specialist at Hair We Are in Fulton, Lucas knows how difficult it can be to lose hair and eyebrows. “Eyebrows are the hardest, because they help define the face,” Lucas said. In order to help those going through cancer treatment, Lucas provides free haircuts, wig fittings and make up application, including how to draw on eyebrows. These services can provide confidence and help find a sense of normalcy during a very difficult time. If you or a loved one has been diagnosed with cancer, call her at 529-0542 to set up an appointment. ROC would also like to thank Carolyn Handville of OCO’s Cancer Services Program and Sara Gozzi from OCO’s SAF Domestic Violence Prevention Program for presenting at their meeting on October 9. October is also Domestic Violence Prevention month and Gozzi shared some of her program’s work to increase awareness and prevent domestic violence in Oswego County. For the month of November, Recognizing Oswego County is seeking nominations in the area of Senior Support. A potential nominee might be an individual that provides companionship to homebound seniors or coordinates activities for nursing home residents. Nominations are due by November 5. ROC members include representatives from a broad range of community organizations as well as individual community members. New members are welcome. Monthly meetings are held from 8-9:15 am on the second Thursday of the month. The November meeting will be held at SUNY Oswego’s Rice Creek.